OTTAWA (Reuters) - A leading member of Canada's main opposition party, who was also a former cabinet minister, has resigned from parliament's national security oversight committee after admitting he sent explicit pictures and video to someone he had never met. 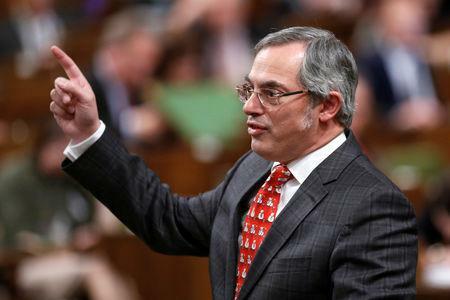 Conservative legislator Tony Clement said he shared the material with "someone who I believed was a consenting female recipient", according to a statement he issued late on Tuesday. "The recipient was, in fact, an individual or party who targeted me for the purpose of financial extortion," added Clement, who was the party's spokesman on justice issues. "I'm taking Tony at his word that this is the first time that this has happened. Obviously, it's a terrible lapse of judgement," he told reporters on Wednesday. Stephanie Carvin, an assistant professor and security expert at Ottawa's Carleton University, said the case was extremely unfortunate for the committee. "It's the kind of thing security agencies really worry about in terms of blackmail material," she said on Twitter. Clement remains a member of parliament and Scheer would not rule out the possibility of his running again in a federal election due in October 2019. Clement apologised to his family and said he would be seeking help.